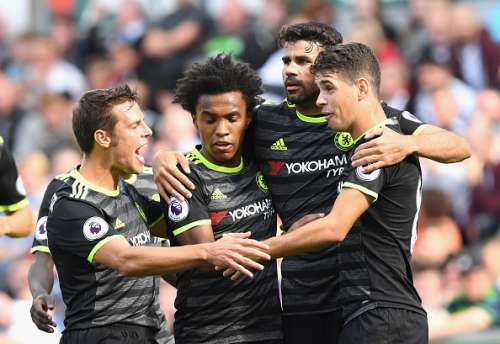 Swansea stalled Chelsea’s 100% start to the Premier League season as the two sides played out an entertaining 2-2 draw at the Liberty Stadium. Chelsea opened the scoring via. Diego Costa following some misjudgement between Federico Fernandez and keeper Lukasz Fabianski. Swansea – who put in a much better showing after the break – turned the game on its head to go in front thanks to Gylfi Sigurdsson’s penalty and Leroy Fer’s capitalization on a Gary Cahill error. Costa brought his side back level in the 81st minute with a bicycle kick after Branislav Ivanovic’s shot was blocked. Both teams went for the win in the dying stages, but had to settle for a point apiece in the end. Antonio Conte’s side absolutely bossed the first half. They looked dangerous from the flanks, as Willian and Hazard both made a number of dangerous runs into the Swansea box. Both the home side’s wingbacks Kyle Naughton and Neil Taylor – who was substituted after 40 minutes – were stretched and didn’t appear to be comfortable tracking down Chelsea’s wide men. Francesco Guidolin’s side hardly saw the ball and as a result, found themselves bereft of goal-scoring opportunities. It also didn’t help their cause that N’Golo Kante was having a field day at the Liberty Stadium. Newly signed striker Fernando Llorente was isolated and barely had a sight on goal. Swansea were lucky to get into the break with just a single goal’s deficit.